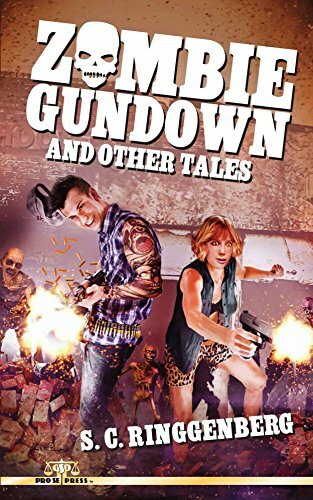 ‘ZOMBIE GUNDOWN AND OTHER TALES’ FROM PRO SE PRODUCTIONS AVAILABLE NOW AS EBOOK! Pro Se Productions, a leading publisher of Genre Fiction, announces that Zombie Gundown and Other Tales by S. C. Ringgenberg is now available in digital format. Flesh eating zombies invade a biker bar! Is it an isolated incident or a ghastly foretaste of a nationwide plague of zombies? Harry Black and his girlfriend Irena have to survive the first zombie onslaught in order to find out while society crashes and burns all around them. Synwulfe, one of the most feared bounty hunters in the solar system, battles an army of homicidal mutant warriors to rescue an armored vehicle full of alluring and beautiful women. But their great beauty conceals a deadly secret. After saving the women from a hideous death, will Synwulfe become their next victim? The starship U.N.S. Tsiolkovsky voyages to Rigel 5 on what the crew things will be a standard search and rescue mission. But the tables quickly turn when the rescue party becomes trapped and is being picked off one by one by a terrifying alien force unlike anything they’ve every encountered. Three tales of terror and adventure by Author S. C. Ringgenberg await those who dare in Zombie Gundown and Other Tales from Pro Se Productions. Zombie Gundown and Other Tales featuring a wildly evocative cover and logo design by Jeffrey Hayes and ebook formatting by Percival Constantine is now via Amazon for the Kindle and www.smashwords.com for most other platforms for only $2.99. This three story collection will be available on other digital platforms in the near future. PRO SE PRODUCTIONS’ ‘DANAKIL DECEPTION’ GOES DIGITAL!